We love a good bun. They are so easy to do and you usually look so pulled together with one in your hair. 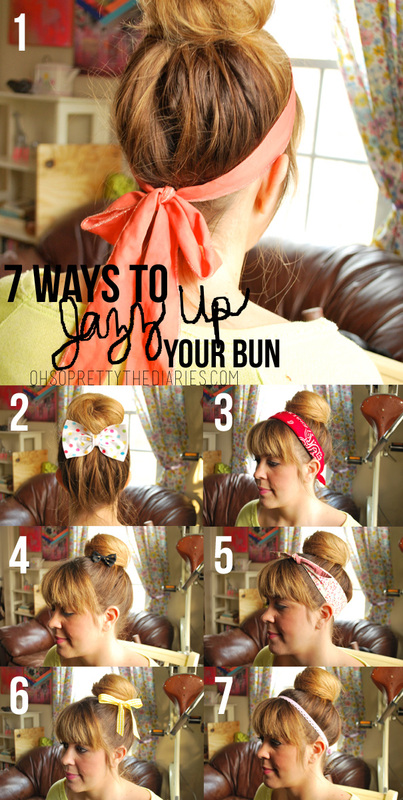 One hair style over and over again can get boring so, here are 7 different ways to accessorize your bun! 1. Tie a scarf around your head. 2. Put a big bow behind your bun. 5. Tie a thick headband at the top of your head. 6. Tie a ribbon around you bun and form the ends into a bow. 7. Wear a stretchy headband. Basically, the possibilities are endless. And if you are wondering how Casey got her perfect bun, check out the tutorial here! Love the bow-behind look. Wanted to try it for a while now! I love the number 2 look, I've been wanting to get a bow so I can try that out myself. these are soooo cute! Lovely idea! These ideas are awesome! Pinning it! Thank you so much!